Gratitude, noun, an emotion of the heart; a state of appreciation, thankfulness, and acknowledgment. With the rush of the holiday season fast approaching, now is the time to pause and reflect on the things for which you are grateful. 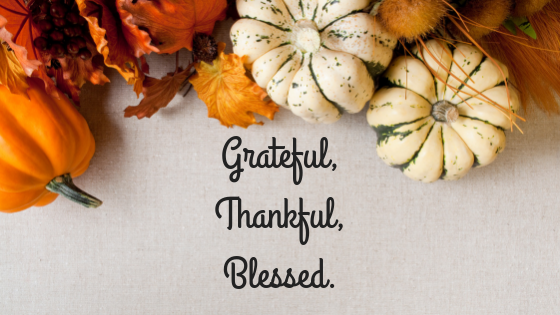 In fact, cultivating a spirit of gratitude is a pursuit worthy of year-round attention! Consider the adage, “A grateful heart sees many blessings.” In the hustle and bustle of life it’s easy to take for granted or overlook the positive things that happen to you – but the more you focus on gratitude, the more you create it for yourself and others. Give thanks. The quickest and easiest way to show your gratitude is to say “Thank you.” Look for opportunities every day to express appreciation to others. Noticing and acknowledging good things makes for a happier, more appreciative mindset. Create a gratitude journal. Carve out 15-20 minutes to write down 100 things you are thankful for and review them throughout the year. Or create a daily practice; write down three things for which you are grateful each day. Notice how focusing on what’s good in your life improves your outlook. Cultivate an attitude of gratitude. When a negative thought or feeling comes to mind, purposely shift your thoughts to something positive. Practice this for a week and see what happens. Empower yourself to be the master of your thoughts and feelings. Recognize the many beautiful gifts life hands us … give and receive gratitude from others … and notice the positive effect it has on you and others! This entry was posted in Archive Newsletter, Celebrate Gratitude, Thanksgiving. Bookmark the permalink.